How much does it cost to travel to Katowice? How much money will you need in Katowice? zł177 ($47) is the average daily price for traveling in Katowice. The average price of food for one day is zł77 ($20). The average price of a hotel for a couple is zł140 ($37). Additional pricing is in the table below. These average travel prices have been collected from other travelers to help you plan your own travel budget. Katowice is a city east of Krakow, in the Silesian province of southern Poland. A large dome crowns the Cathedral of Christ the King, built between 1927 and 1955. The adjacent Archdiocesan Museum exhibits Silesian sacred art. The ultramodern Silesian Museum features several glass structures on the site of a former coal mine. It exhibits Polish art and chronicles the history of Upper Silesia. Historically, Katowice is a product of the 19th-century industrial boom, but it only became a city in the interwar period. After WWII, at the height of the Stalinist cult craze, the city was renamed Stalinogrod, but reverted to its old name soon after Comrade Joe died in 1953. Katowice has few significant historical monuments, but it's a major commercial and cultural center and holds sufficient attractions to make it worth a stop. Katowice has some interesting and notable sights that are well worth a visit. Christ the King Cathedral in Katowice is an impressive architectural project, designed and built during 1927 and 1955. Its design is reminiscent of classical architecture. The difficult time of World War II forced a pause in the creation of the Cathedral. The building often hosts organ concerts and other events, such as the presentation of the 'Lex ex Silesia' award for a significant contribution to the development of Silesia's cultural heritage. Goldstein Palace is one of the most representative palaces in Katowice. Built at the end of the 19th century in a neo-Renaissance style, the palace once served as a commerce chamber, a theater, and other institutions. Nowadays it is home to a civil registry, but it is worth entering in order to see the beautiful, golden staircase and hall, and the ceiling above them. St. Mary's Street, once a dilapidated part of the city, St. Mary's Street was given a massive makeover in the early 2010s. Today, this pedestrianized zone has become a popular place for Katowicians attracted by its many pubs and growing number of restaurants. At the end of the street is St. Mary's Church, the road's namesake. St. Mary's Street is also a popular venue for outdoor events, and can be crowded on warm spring and summer nights. Parachute Tower - a 160 ft tall lattice tower built in 1937 for training parachutists. It was used in the first days of World War II and is the only parachute tower in Poland. Welcome to the very center of Silesia, downtown Katowice where the city's skyline is changing rapidly and the now very walkable Katowice center is a hub of architectural marvels amidst a sea of post-soviet urban and suburban sprawl. In short, totally unique and well worth exploring the many museums, bars, restaurants and clubs populating the ever-changing Silesian landscape. Located mid-way between Katowice and Chorzow on the site of an old 1904 coal mine, the spectacular Silesia City Center easily trumps everything else in the region. Some features include the preserved, red brick St Barbara's Chapel and the remains of the tower that once lowered the miners underground - now the symbol of the commercial center. The former workers' district of Nikiszowiec is home to some highly unique early 20th century architecture as well as an excellent modern art gallery, a magnificent church and a few additional offbeat attractions. This forgotten attempt at plebeian paradise is earmarked on Silesia's Industrial Monuments Route' and offers intrepid visitors a confounding, yet fascinating glimpse at a foregone age. While not long ago a walk around the neighborhood may have been a dicey prospect, cafes and culture are now beginning to creep into this part of town and you're no longer likely to be the only tourist prowling around. Perfect for a photo essay, charge up your camera battery and off you go. Another workers' colony from the same sibling pair behind Nikiszowiec, in the case of Giszowiec, the Zillmans took a completely different conceptual approach, designing an ideal garden city' for local miners based on the ideas of famous British urban planner Ebenezer Howard. Modelled on rural English cottages, the original dwellings of Giszowiec are low, freestanding, sloped roof houses surrounded by garden plots. Built between 1906 and 1910, the neighborhood was arranged as a web of streets extending from Plac Pod Lipami - the central square surrounded by public buildings, shops, a restaurant, school and tavern. The project included a public laundry, a women's bathhouse, theatre, quarantine barracks for the diseased, a prison and a strict set of guidelines to ensure the precious 'English village' atmosphere wouldn't be lost. Go to an event at the Spodek arena. 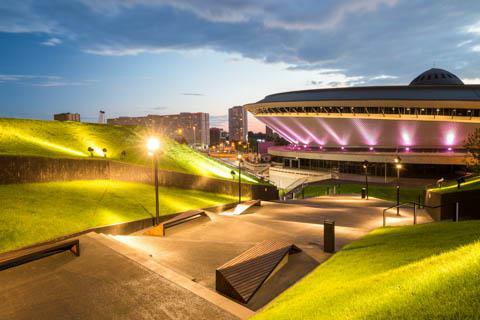 Spodek, the biggest arena and concert venue in Katowice, is a cultural must. From the outside, it resembles a flying saucer or a UFO spaceship. It was built in 1972 and, apart from the concert hall, it is home to a number of recreational attractions such as: a few gyms, restaurants, an ice rink, and a hotel. It is here that the biggest and best concerts, sport events, and cultural activities are hosted. Go to the Silesian Museum. This beautiful museum survived a Nazi attack and was reinstated in 1984. In it you can learn about the Silesian history and art by visiting the exhibitions about the region's ethnology and archaeology as well as the collection of Polish paintings by, for example, Stanislaw Wyspianski and Olga Boznanska. Additionally, the photography collection is rich in 35,000 pictures and daguerreotypes, some of which document World War I or the Uprising of Silesia. Others depict beautiful portraits. Katowice is one of the epicenters for cultural events in southern Poland. Exhibitions, concerts, a festival are regular occurrences in the city's galleries, clubs and theatres. A few events include: Silesian Beer Festival, Polish Directors' Art Festival, which is a theatrical and television drama festival where directors compete for the Konrad Prize, the "A Part" Theatre Festival, which is an international review of alternative and experimental "OFF" theatres rather than classic ones, the ARTerie young art festival, which is an annual festival of students' from art universities and faculties, taking place in the autumn, and the Tauron Festival, which is a techno and dance rave that takes place in the Industrial Museum Complex, just to name a few! The cuisine in Katowice offers more than just a traditional plate full of meat and potatoes. There is a great variety of restaurants all around town, with a mixture of Silesian and international culinary traditions represented. There is something for everyone, from burgers and sushi to the famous Polish pierogi, which can all be accompanied with a good beer - you will definitely enjoy it. The city and the area are served by the Katowice International Airport, about 19 mi from the city center. Katowice Central Station is one of the main railway nodes and exchange points in Poland. The city has direct connections, among others, with Warsaw, Cracow, Szczecin and Gdynia. The public transportation system of the Katowice and Upper Silesian Metropolis consists of four branches-buses and trams united in the KZK GOP and the regional rail. Additional services are operated by private companies and the state-owned railways. Silesian Interurbans is one of the largest tram systems in the world. It spreads for more than 31 miles and covers 14 districts of the Upper Silesian Metropolis.